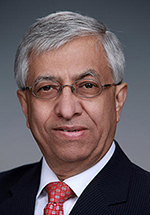 In recognition of an exceptional career devoted to Earth science, Pacific Northwest National Laboratory scientist Dr. Ghassem Asrar received the 2018 Cleveland Abbe Award for Distinguished Service to Atmospheric Sciences by an Individual. Asrar accepted the award January 10 at the 2018 American Meteorological Society (AMS) Annual Meeting in Austin, Texas. Since 2013, Asrar has been the director of the Joint Global Change Research Institute, a collaboration between PNNL and the University of Maryland, College Park. With scientific experience across a broad array of U.S. and international governmental organizations and businesses, Asrar has enhanced the institute's leadership in understanding Earth system changes through the lens of science, economics, technologies, and policy decisions. "Throughout his career, Dr. Asrar has provided outstanding leadership across a wide range of climate and Earth science projects, programs, and activities," said Dr. Ian Kraucunas, director of PNNL's Atmospheric Sciences & Global Change Division. "He is not only committed to scientific excellence, but to building up the people and capabilities needed to achieve it." The AMS Awards Oversight Committee considers nominations for the Cleveland Abbe Award (presented annually since 1963) and makes recommendations for final approval by the AMS Council. Asrar, an AMS Fellow since 2001, received the Cleveland Abbe Award for his "exceptional leadership of major activities at NASA and the World Climate Research Programme (WCRP) that advanced climate science and its relevance to society." Asrar worked at NASA from 1987 to 2006 and at the WCRP from 2008 to 2013. "I am honored to be the recipient of this year's Cleveland Abbe Award, considering its purpose and joining the distinguished roster of previous recipients," Asrar said. "I am delighted that my contributions and service to Earth and atmospheric sciences are being recognized by colleagues who supported me throughout my tenure at NASA, WCRP, and now at PNNL, and my nomination for this prestigious award." At NASA from 1992 to 1998, Asrar was the chief scientist for the Earth Observing System, a satellite-based program. This endeavor revolutionized scientific understanding of Earth's climate and biogeochemical systems by providing new, fundamental insights into the relationships between Earth's land, oceans, atmosphere, ice, and life. Asrar also established the NASA Earth System Science graduate student fellowship and New Investigators Postdoctoral Program. These forums have provided training for thousands of early career Earth system scientists and engineers. In 1998, Asrar became NASA's Associate Administrator for the Office of Earth Science. During Asrar's six years in that role, NASA launched more than 20 Earth-observing research and operational environmental satellites. Asrar also guided the development of a comprehensive data system to manage record amounts of unique information resulting from these satellites. From 2004 to 2006, Asrar was the Deputy Associate Administrator for the Science Mission Directorate at NASA headquarters in Washington, D.C. With more than 250 employees and an annual budget of about $5.5 billion, this organization focused on scientific research, modeling and data analysis, as well as developing, launching, and operating advanced sensors and satellites for studying the Earth, moon, solar system, and faraway galaxies. It also developed and operated multidisciplinary communication networks, data and information management systems, and airborne and suborbital research facilities around the world. While with NASA, Asrar served as co-chair of the Interagency Working Group on Earth Observations, chartered by the National Science and Technology Council's Committee on Environment and Natural Resources (CENR). The working group developed a strategic plan for the U.S. Integrated Earth Observation System and defined U.S. contributions to a 10-year plan for implementing a global system that would lead to comprehensive, coordinated, and sustained Earth observations. That group eventually became a CENR subcommittee known as the U.S. Group on Earth Observations. Asrar also vice-chaired the U.S. Climate Change Science Program, a consortium of federal agencies working to coordinate and direct U.S. research efforts in climate and global change. He helped develop the program's 10-year strategy and implementation plan. From 2008 to 2013, Asrar was the director of the WCRP in Geneva, Switzerland. The program is co-sponsored by the World Meteorological Organization, the Intergovernmental Oceanographic Commission of UNESCO (United Nations Educational, Scientific, and Cultural Organization), and the International Council for Science. Asrar championed the WCRP's mission to facilitate Earth climate system analysis and prediction for use in an increasing range of applications for decision makers worldwide. He guided the development of WCRP Grand Science Challenges—areas of emphasis in scientific research, modeling, analysis, and observations—as the program's major focus for the coming decade. Under Asrar's leadership, other key WCRP concentrations included regional, seasonal, and decadal aspects of climate research, modeling, and prediction, as well as building research and analysis capacity in developing regions of the world. The program placed more emphasis on synthesizing, analyzing, and translating climate science knowledge for application in adaptation planning, risk management, and socioeconomic development. It employed greater use of observations in conjunction with Earth system models, and in analyses and re-analyses of Earth's past and present climate state. The number of countries participating in the WCRP and their financial and in kind contributions for program activities steadily grew during Asrar's tenure. Asrar also served as co-director of the World Meteorological Organization's research department. In that role, he promoted greater coordination and cooperation between scientists and research centers to enable seamless predictions of climate and weather across time and space scales. Born in Shiraz, Iran, Asrar earned master's degrees in civil engineering and soil biophysics, and a PhD in environmental physics from Michigan State University in East Lansing, Michigan.